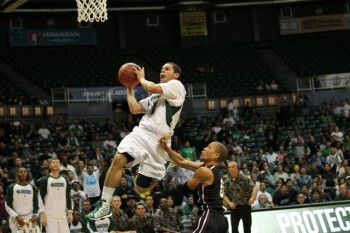 Sophomore point guard Bobby Miles will not return to the Hawai’i basketball team next season, head coach Gib Arnold announced on Wednesday. Miles, a reserve player during his two seasons with the Warriors, will transfer to a program closer to his home in Los Angeles, Calif. Miles averaged 2.2 points, 1.6 rebounds and 1.5 assists per game as a sophomore this past season. He played in 26 games, including seven starts. He played a key defensive role in several games, but his minutes diminished late in the season. As a true freshman during the 2010-11 season, he averaged 2.2 points, 1.3 rebounds and 1.9 assists per game. Miles is the second Warrior to depart the program since the end of the season last month. Junior forward Joston Thomas announced two weeks ago that he will pursue a career in professional basketball. The departure of those two players means there will be at least two scholarship openings on the roster for the 2012-13 season. The signing period for new recruits begins on April 11. Good luck to Bobby. Is it true Garrett Jefferson won’t be on scholarship for next season? So three will be available? I heard that same rumor. Good luck Bobby! tough Defense Work the System & Practice & Shoot Lights Out! with theTalent on Next Year’s Team… ALL Mandatory! may you find your place in the sun. Wish you well when you go back to Cali. You sure did give your all and when you did fans and coaches appreciated it. Mahalo.